Yum, yum and more yum. Dinner last night turned out really well, with plenty of food and fun to go around. 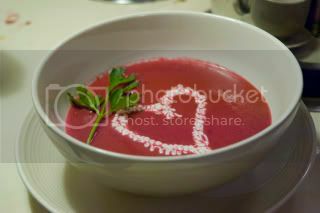 The now-infamous beet soup was even better than I could have imagined. I followed the recipe pretty much exactly as written, though I did add about a teaspoon of vegetable bouillon, because soup without salt is not really a soup worth enjoying. I doubled the recipe, and had more than a little “fun” in trying to peel the roasted beets – my fingers are still a bit purple, but last night, I actually looked like an accident victim….yikes. Apparently, roasting and peeling veggies is miserable regardless of what veggie you’re roasting. I thought I would also share a few tips on cleaning leeks – these guys are a little bit pesky when it comes to cleaning. If you just wash the outside, you’re likely to end up with a gritty soup (and who know what that grit really is…..) because leeks are literally full of crap. A few years ago, I read this method of cleaning leeks and wanted to share…. 1) Cut off the root, and cut off the dark green parts, so you’re left with just the white and pale green portion. 2) Cut this lengthwise, so you know have two long half-leeks. 3) Chop into ¼” wide pieces (give or take – most recipes call for chopped leeks like this). 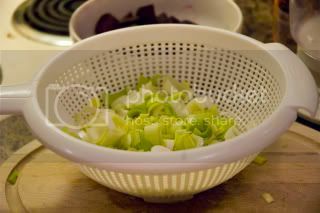 4) Put the chopped leek in a strainer and give it a really, really good rinse. This method gets rid of all the grit and crap and leaves you with tasty leeks, ready for consumption. Another aspect of this recipe that I loved was the slightly unusual seasoning – rather than more typical Italian herbs, this recipe incoporated a little bit of exoticism by adding some allspice and ginger (I subbed fresh because I was out of dried, and I just prefer fresh for most applications – baking excluded). I also used marjoram instead of time (because I had it). And because I was just having way too much fun in the kitchen, I arranged it all and snapped a pic for y’all. And last, I have to say that the colour and flavour and presentation of this recipe more than surpassed my expectations. It was a brilliant fuschia (you absolutely have to use whipping cream in this recipe – skim or other lower fat product wouldn’t have the whitening (pinkening?) power. It was so gorgeous in the bowl, I almost didn’t want to eat it. I used low-fat sour cream to drizzle over the top. I just put it in the corner of a plastic baggie and snipped a tiny little hole – the smallness of the hole, partnered with the velocity of the sour cream made a kinda fun squiggly effect. I garnished with a sprig of flat-leaf Italian parsley. The flavour was milder than I would have thought, given the rich colour. There was a definite beet flavour, but the creaminess and the celery balanced it nicely. I liked the hint of allspice, and might even consider adding a touch of cinnamon and cumin in the future. Very tasty. Hubs didn’t mind so much – he ate most of his little bowl. I wrote his name with the cream, and this had the desired effect of guilting him into at least trying the dreaded beets…. The main course was Hungarian beef goulash…..planning-wise, I’m sure I could have done a little better – this was more of a stew than I had anticipated, so the beet soup and goulash is not a combination I would serve to guests, though each dish on its own is pretty good. I loved the loads of paprika in this recipe, and thought it added a touch of fun to it. In retrospect, I would add some garlic, and also perhaps some parsnips to deepen and vary the flavour of the finished recipe. Perhaps using hot or smoked paprika would also change the depth of this. Not so great, however, is the condition of my poor pot at the end of all this – not sure what I did wrong, but I ended up with a thick layer of burnt crustiness at the bottom of the pan. Going to have a TON of fun getting that crap off. Meh. My other issue with the recipe is the fact that it calls for 1 T of tomato paste….I know that technically this stuff is now available in tubes, but I’ve yet to find it. I really want it, because it felt so wasteful and ridiculous to throw out the remainder of the tin this morning (yeah, I know, Martha would have frozen the remainder in ice cube trays or some other nonsense, but keep in mind who’s writing this….hahahaha). Anyway, here is the recipe for the Hungarian beef goulash, with my substitutions and suggestions in parentheses. Recipe modified from one-pot cooking, which is a british book, with wacky british names and measurements….tons of fun for the Canadian cook! Preheat the oven to 400F. Heat the butter in a large heavy pot, season the meat and add to the dish. Add the onions and cook for 2 minutes, stirring. Add the paprika and flour, mix well and place in the preheated oven, uncovered, for 10 minutes. Remove from the oven and mix in the tomato purée. Reduce the oven temperature to 350F. Add enough of the stock to cover the meat. 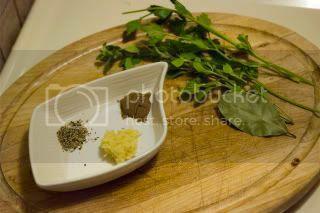 Bring to a boil on top of the stove and season. Cover with a lid and return to the oven for 2 hours. After 1.5 hours, mix in the chopped carrots and potatoes and cook for another 30 minutes, or until the meat and vegetables are tender. 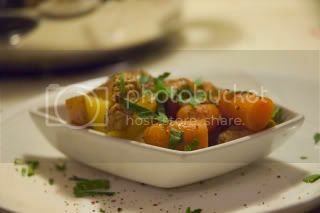 Sprinkle with chopped parsley to serve. Last, I just want to say that my photos will soon be getting much better – my lovely hubby has agreed to build me a light box, so I’ll soon be able to take much prettier pictures. Now, I better get cleaning because my in-laws are coming for dinner on Tuesday, and I have a first-class messy disaster to be rid of…….I’ve even noticed my rabbits start to write “dust me” with their little paws on the floor of their pen…….yikes. I know what you mean about the tomato paste in a tube, the product that has been eluding me is sun dried tomato paste. It just sounds so good :) Good luck in finding your tomato paste!